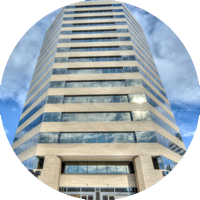 Enjoy the ideal locations of Executive Business Centers in Denver. Conveniently located in the heart of the Denver Tech Center, at the intersection of I-25 and I-225, both Centers are thirty minutes from Denver International Airport and fifteen minutes from Downtown. From Downtown Denver, take I-25 South to exit 199 for Belleview Avenue. Turn left onto Belleview Avenue and in 0.25 miles our location will be on your left in Belleview Tower. From Denver International Airport, take Peña Blvd and merge onto I-70 West. In 0.2 miles, take exit 282 to merge onto I-225 South and follow to exit 1A for I-25 South. Use the middle lane to take exit 1A and keep right to continue on exit 199 towards Belleview Avenue. Turn left onto Belleview Avenue and in 0.25 miles our location will be on your left in Belleview Tower. From Colorado Springs, take I-25 North to exit 199 for Belleview Ave. Turn right onto Belleview Avenue and in 0.2 miles our location will be on your left in Belleview Tower. Light Rail: Travel to downtown Denver in just minutes via Light Rail. The Belleview Station is a 7 minute walk from our Belleview location. Light Rail maps are available at http://www.rtd-denver.com/. Take the light rail to Park Meadows Retail Resort, Downtown Denver, and in 2018, Denver International Airport. RTD Call-n-Ride: Call-n-Ride is a personalized bus service that travels within select RTD service areas. One phone call can connect you to bus routes, Park-n-Rides, rail stations or to work, school, and appointments. Make your reservation and we’ll provide an estimated pickup time. When the bus arrives, pay your exact cash fare. It’s that simple.